This entry was posted on April 1, 2015, in Events and tagged Coliseum Medical Centers, Coliseum Northside Hospital, community, Event, Meeting, Town Hall. Bookmark the permalink. Meet Face to Face with the Colisuem Medical Centers’ and Coliseum Northside Hospital’s Administrative Teams! 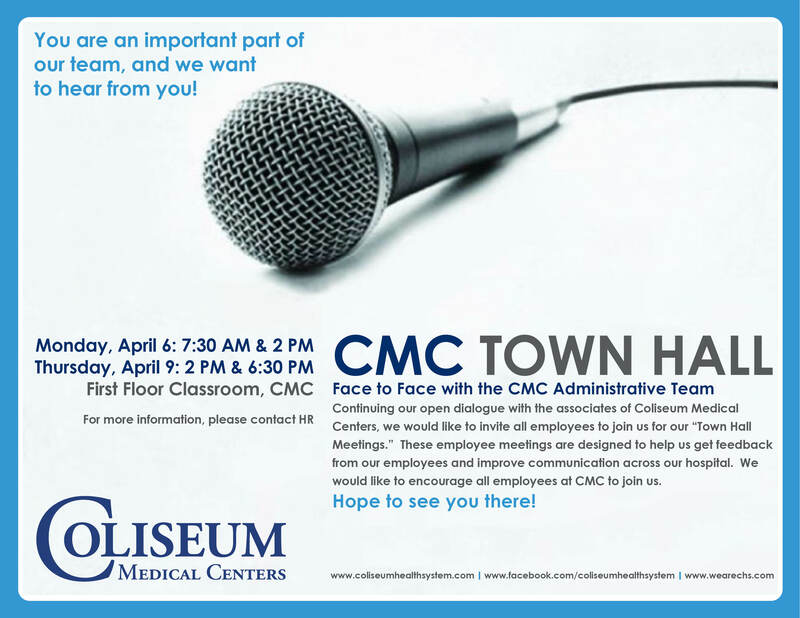 Continuing our open dialogue with the associates of Coliseum Health System, we would like to invite all employees to join us for our “Town Hall Meetings.” These employee meetings are designed to help us get feedback from our employees and improve communication across our hospital. We would like to encourage all employees at CMC & CNH to join us at their respective town hall meetings. Hope to see you there!